Yard Limit Boards: 2,791 feet northCovers yard limit to Allandale CNR.CR.NOD.8, p. 4 . Trains instructed to meet or wait by train order will do so at lead switch South end of station platform. No. 3 will stop at Barrie and Orillia to entrain traffic for points Washago and West. 1865c NRC constructs first, wood frame station Simcoe County Archives—correspondence; Frim-2002, p. 55 . 1865-06-17/1865-06-20 NRC advertises opening to Barrie The Daily Globe (Toronto), June 17 through June 20, 1865 . 1865-06-21 NRC opens to Barrie The Daily Globe (Toronto), June 22, 1865; Smith-1956, p. 35 Stevens states that the "Barrie Switch" opened in June 1859 Stevens-1960, p. 401 ..
1870c NRC constructs second, brick station Simcoe County Archives—correspondence . 1945 Canadian General Electric opens small appliances plant GE Canada website . 1961-10-29 Appears in time table CNR.A.190; CNR.GLR.NOA.32, p. 3 . 1962-04-29 Absent from time table CNR.A.191; CNR.GLR.NOA.33, p. 3 . 1984 GE's small appliances unit sold to Black & Decker GE Canada website . NAC / 32819 Street and waiting room end elevation of second station. 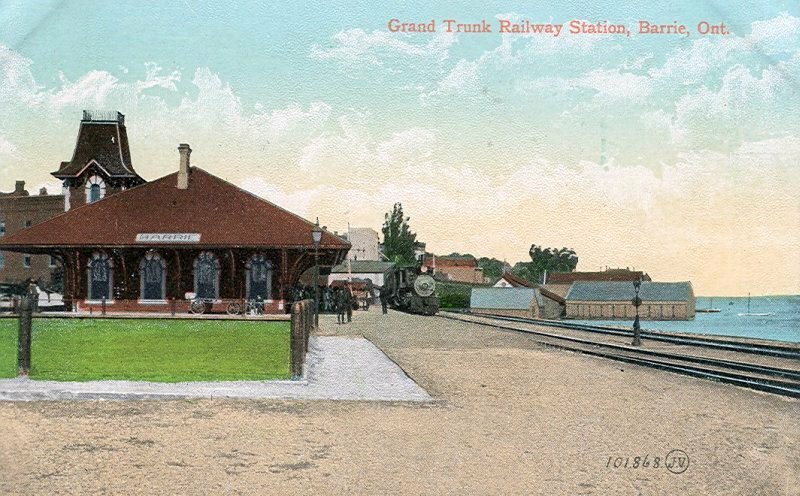 Albertype Company collection, NAC PA-032854 Postcard of GTR station and post office. Walter Scott, Barrie. Postmark illegible. 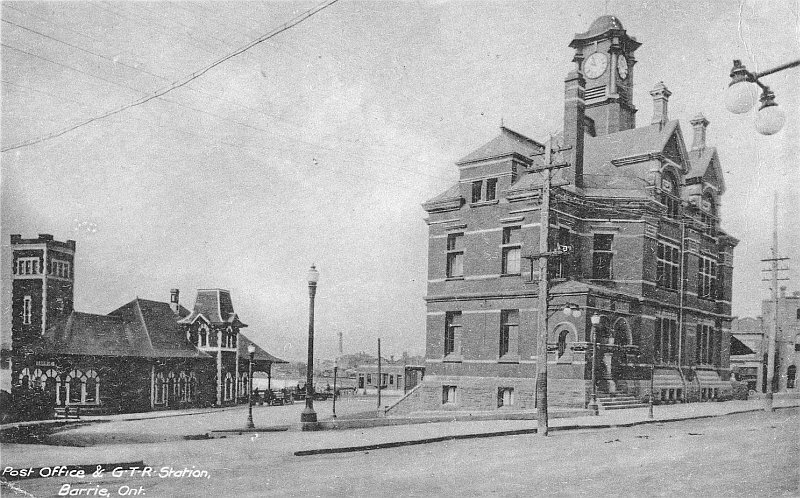 Note that the station does not have the circular (ladies) waiting room on the east end, the tower nor the bay window, so this photograph must be of the station as it was originally constructed. Second station in the NRC era showing relationship to wharf. The side wheeler is the Northern Railway of Canada's "Lady of the Lakes". It is clear that the "covered shed" shown on NAC/NMC78983 was not original to the station. Built by Captain Hugh Chisholm for Captain Issac May and named for that latter's daughter, the "Emily May" was launched in 1861. At 144 feet long and with a capacity of 400 passengers, she was the largest steamer to operate on Lake Simcoe. Purchased in 1874 by the Northern Railway, she plied Lake Simcoe as "Lady of the Lakes" until 1883 when she was burned at her moorings at Belle Ewart Hunter-1909; OPL / William Frost Scrapbook; Historical Plaque, Belle Ewart . NLC/CIN Record 279, Barand Brothers Reception of the Governor-General and Suite at Barrie, Ontario. NAC / PA-32819 Postcard view of second NRC station. JPS Collection A postcard of the second NRC station during the GTR era before renovations. Published by N.W.E. King, Barrie. Postally unused. JPS Collection A postcard of the second NRC station during the GTR era before renovations. Published by The Valetine & Sons Publishing Co., Ltd., Montréal and Toronto (No. 101.868). Postally unused. JPS Collection A postcard of the second NRC station during the GTR era before renovations. Published by Nerlich & Co., Toronto. Postally unused. JPS Collection A postcard view Overlooking G.T.R. 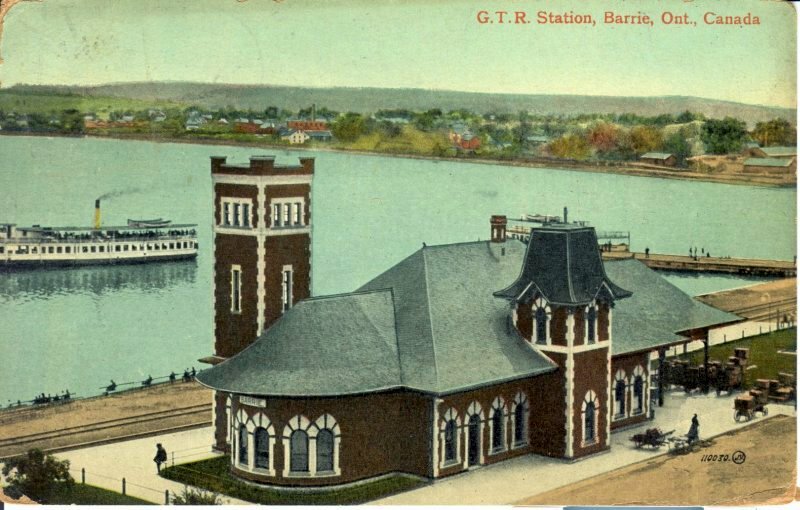 Station and Harbor, Barrie, Ont. showing second NRC station during the GTR era before renovations. Printed by Warwick Brothers & Rutter Ltd., Toronto. Postally unused. 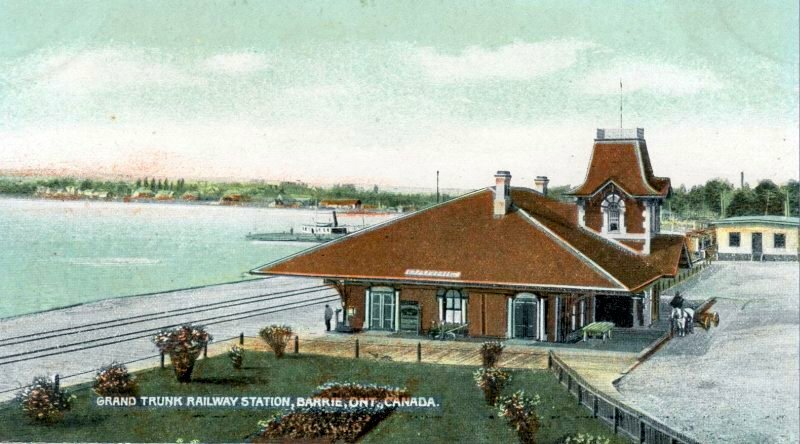 JPS Collection Postcard view of Barrie waterfront looking towards station. Published by Warwick Brothers & Rutter Ltd., Toronto. Postmarked December 20, 1905. 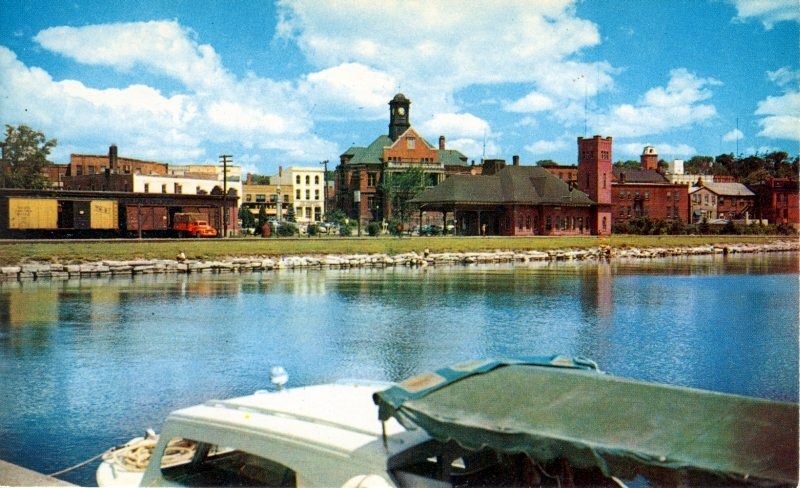 JPS Collection Postcard view of Barrie waterfront looking towards station. JPS Collection Postcard view of second station in the GTR era after renovations, which added the tower and "covered shed". Published by Valetine & Sons Publishing Co. Ltd., Montréal and Toronto. Postmarked August 17, 1914. TRL/CPCC Acc. PC-ON 99 Postcard view of second station in the GTR era after renovations, which added the tower and "covered shed". JPS Collection Low level postcard view of second station in the GTR era after renovations. Published by Novelty Manufacturing & Art Printing Co., Montréal. Postally unused. 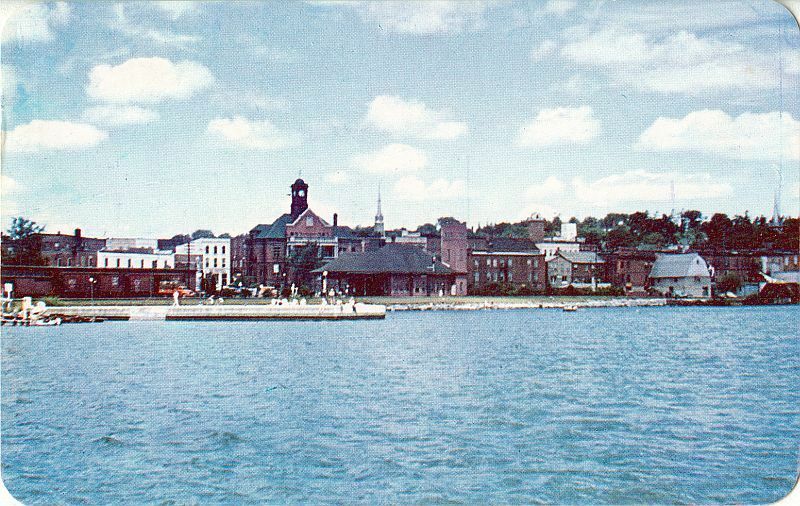 JPS collection Postcard view of second station and waterfront in the GTR era from Kempenfeldt Bay. Published by Valetine & Sons Publishing Co., Ltd., Montréal and Toronto. Printed in England. Postally unused. 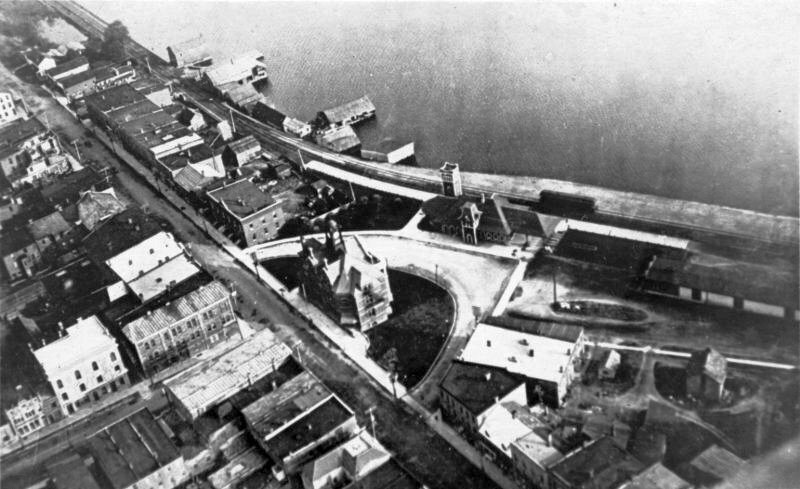 JPS collection Aerial View, Barrie, Ont. Published by Photogelatine Engraving Co., Ltd., Toronto. Postally unused. 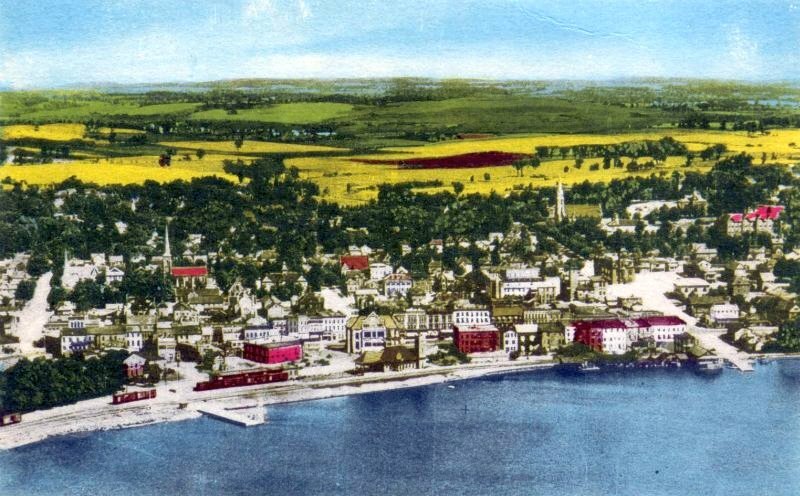 JPS Collection Similar to colored aerial view of Barrie above; however, postcard is titled Allandale, Ont. Published by Photogelatine Engraving Co. Ltd., Ottawa. Postmarked Allandale August 26, 1926. 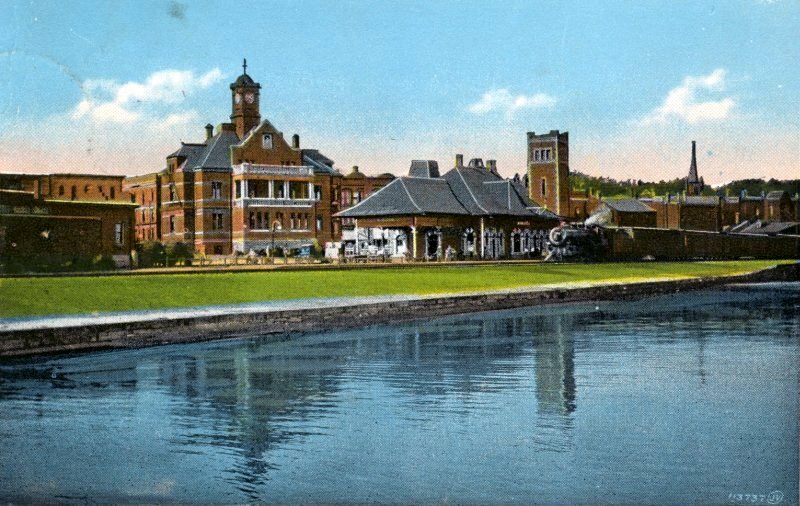 Unknown Postcard view of second station and waterfront in GTR era. 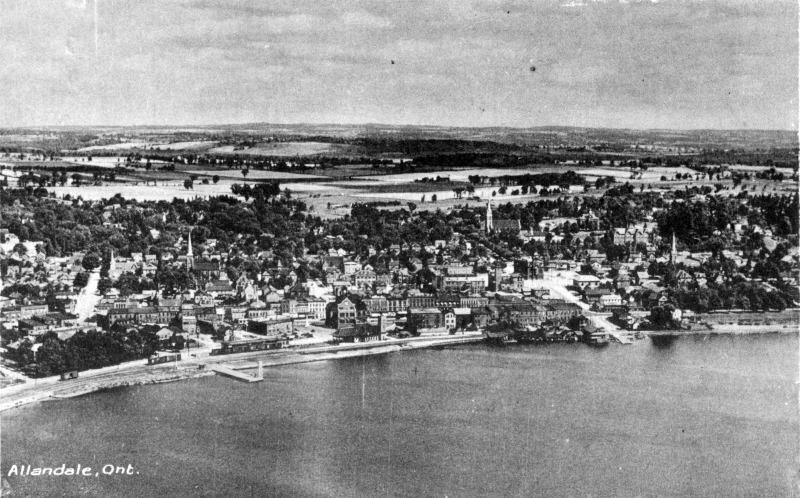 JPS collection Postcard aerial view of Barrie. Postally unused. JPS collection Postcard view of station and postoffice. Printed by The Photogelatine Engraving Co. Ltd., Ottawa. Postmarked August 9, 1928 at Orillia. 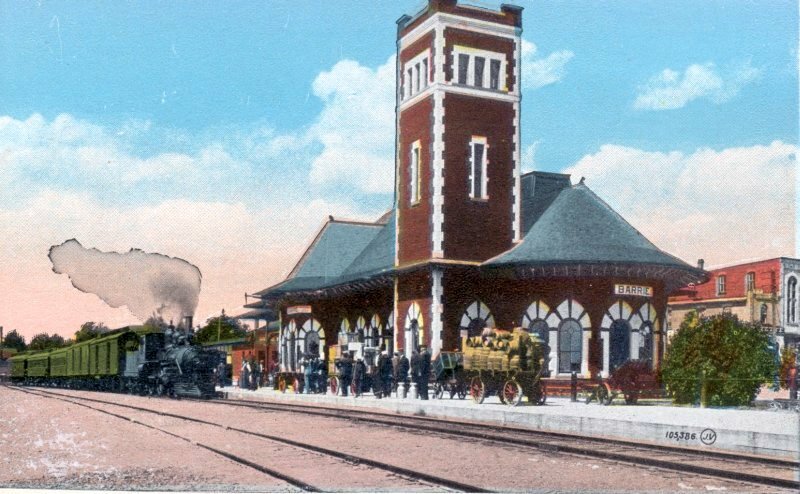 Albertype Company collection, NAC PA-032820 GTR station. JPS Collection Postcard view of C.N.R. 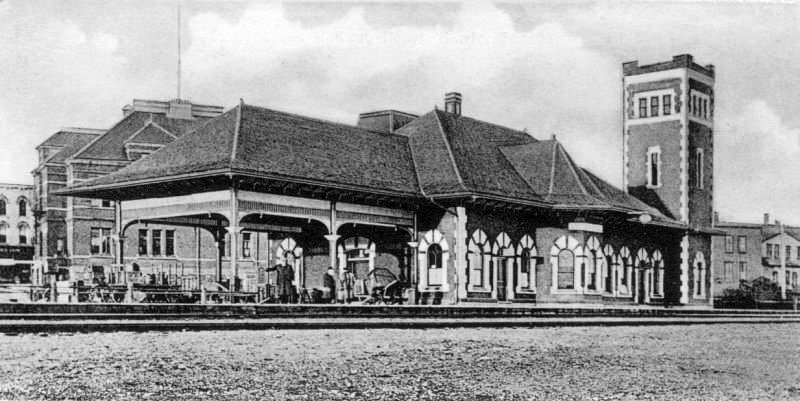 Depot, Barrie, Ont., Canada. Published by Valetine-Black Co., Limited, Toronto. Postally unused. 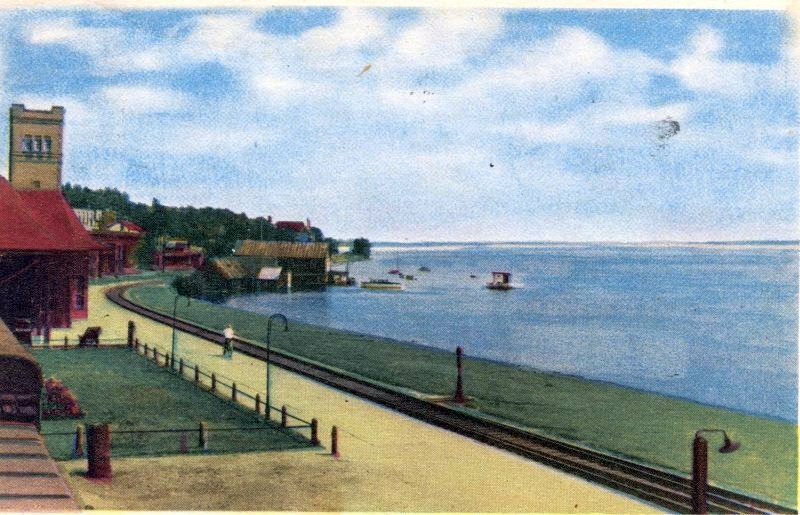 JPS Collection Postcard view of The Water Front, Lake Simcoe, Barrie, Ont., Canada . Published by Valentine-Black Co., Ltd., Toronto. Postmarked June 14, 1930. 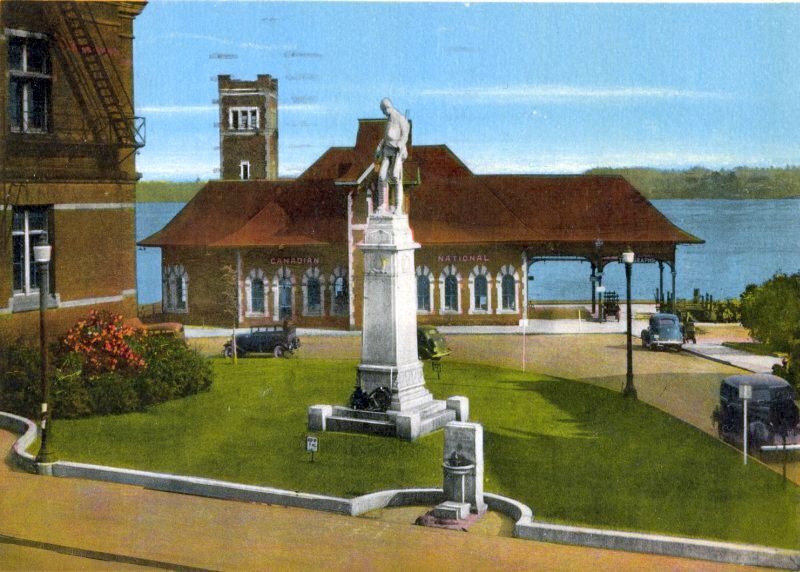 JPS Collection Postcard view of Cenotaph, Barrie, Ontario, Canada and rear of railway station. Published by Photogelatine Engraving Co. Ltd. Ottawa. Postmarked 1943-04-03 at Camp Borden, Ont. M.P.O. 202. JPS Collection Postcard view of CNR Station and Waterfront, Barrie, Ontario, Canada . Published by Jack H. Bain, Toronto. Postmarked 1948-06-25. SCA Rear elevation of station (rotated and cropped from original). Dave Shaw Collection CNR station. John Rehor photo, Keith Hopkin collection CNR station. JPS Collection Postcard view of The Waterfront, Barrie, Ontario Canada. Published by Royal Specialty Sales, Toronto, ON. Plastichrome® by Colourpicture Publishers, Inc., Boston, MA. Postally unused. JPS Collection Skyline of Barrie, taken from Kempenfeldt Bay. Barrie, Ontario, Canada. Published Alex Wilson Pub. Ltd., Dryden, Ont. Postally unused. 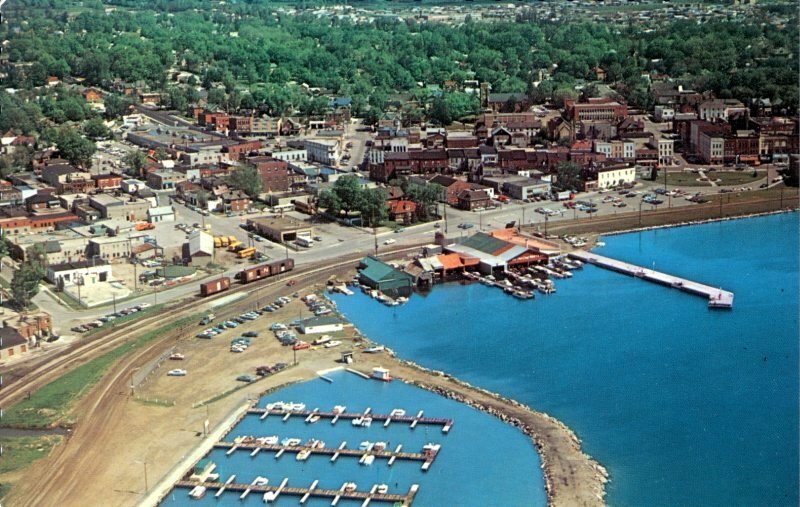 JPS Collection Postcard view of Barrie showing redevelopment of waterfront. Published by Peterborough Post Card Co., Peterborough, Canada. Postally unused. n.d. NAC / Col. RG30M Acc. 945013 Box O Yard. 1594-8. 1870 NAC / Col. RG30M Acc. 945013 Box P 976-9 Barrie, Front. 1892 NAC / Col. RG30M Acc. 945013 Box P Barrie Br. Anderton's encroachment (976-5). 1903c NAC / Col. RG30M Acc. 78903/42 Item 31 G.T.Ry. New office and storeroom. Front and side elevation. Section. Ground and cellar plans. SCA / Acc. 2003-24 C.N.Rys. Station. Ground floor plan.